If bicyclists are getting killed because of their missteps, then why do car owners bear the brunt of changes that are being made? Why don’t bicyclists have to change? Great Question Victoria: Its time to License Bicyles, Registration,Insurance, Road Taxs, the whole works. 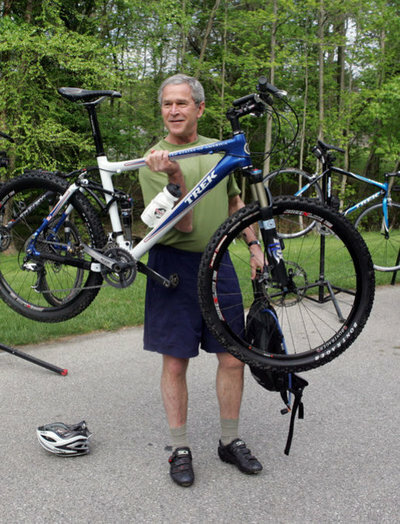 Put large tax’s on Bicycle Tire’s, Heavy regulations should be put on all Bicycles. I think theres a blurr between a Right to operate a bike vs. a Privilege to operate a car, truck, etc. Maybe they should both be a Privilege. But then again maybe 19th century bicycles should go the way of the DOE-DOE BIRD. Ps: Notice that Bike lanes are getting a little wider each year. Why don’t they uphold traffic laws for bicycles, like they do cars? I agree with Klatu that bike riders should be licensed and taxed as are car drivers. If they demand equal rights to the road, they should pay equally and follow the same laws as the rest. Maybe they need to learn to pedal a bit faster as well, so as not to block traffic. Here is a Unique Suggestion. Revert to the way I was taught as a child. Always ride facing traffic. It makes you more visible to traffic. Always obey stop signs and other traffic control devices. Yield the Right of way . And In the 1950’s as a child I had to Pay 0.25 cents a year to register my bike and hang the tag. How quaint. Hey, everybody, did you hear? In the old days bike riders used to follow the traffic signs! DD877: Its time to ban Bicyles off of all roads. Lets get a measure going to do just this folks. Bike riders would fair a lot better, Klatu, that’s for sure. Standard rule in driving is whoever has the most lug nuts has the right of way. Spokes don’t even enter the picture. I saw a Bumper sticker once that said “MY HUMMER CAN BEAT UP YOUR BICYCLE”. I thought it was cute, but a bike nowadays is a Political Statement by the Democrat Party and its base to get “YOU” out of your car,and onto a bike, public transportation, TRAINS(DEFUND AMTRACK NOW)etc. When are all car drivers going to wake up and vote 100% against the “Democratic Socialist get out of your car and onto a bike Party”? Cheesey, seek help. You desperatley need it. Right on KLATU Where and when do we start. All the bike riders that are everywhere one looks and drives is just another major reason I go into Portland only when absolutely necessary. And that is very rarely. I guess I am a couple days late to have my comment seen. But I am a political conservative and I ride a bicycle regularly AND I obey traffic laws. There are two things that terrify me as a cyclist: First, a motorist can break the law killing me and receive only a ticket (like has happened in Hillsboro and Cornelius twice in the last year), Second, that any of us would place our convenience above someone else’s safety. The last thing is this: it seems to me that bicycles do not block traffic, but are a part of traffic, just like a tractor on a rural road. I came thru the intersection on Interstate this morning at about 7AM. I was waiting to turn right and a cyclist blew by doing at least 30MPH coming down the hill. I looked to the left at the barricades and considered this issue. It was still dark, windy, and there were wet leaves caking the street in spots. These are hazarous conditions for a cyclist and many of them give no concern to their own safety. This cyclist was simply going too fast for the conditions. In North Portland they have added those concrete islands that force drivers to veer into the bike lane. I think these are a safety hazard too.